Packing and Moving? Did You Forget…? Check Again! There is nothing more nerve-wracking than moving. From finding a new home and hiring a moving company, to packing all your belongings and changing your address, a move can quickly wear you down. Even with the most thorough planning and list making, it is easy to overlook the molehills that quickly escalate into mountains on moving day. Keep your move seamless by remembering those “little” things. Then maintain your calm by using a 5A Rent-A-Space self-storage unit near Lafayette for those items that will only clutter your new home. When you rent from us, we will even haul your stuff in our free moving van. Deal with the stuff in your dressers. In the mad frenzy of clearing out closets and packing up dishes, one area that can often get bypassed is your dresser. It is easy to understand since you are probably still using those clothes right up to moving day. A couple of days beforehand, grab a suitcase and pack up a few days worth of clothes. Then empty the rest of your drawers, so your heavy dresser will not be damaged in transit. If you carry it full of stuff, it is possible to break the legs or any fragile items inside. Handle parking arrangements for your movers. Avoid waiting until the morning of your move to determine where the movers can park their truck. This includes renting a moving van yourself. You can quickly rack up fines for illegal parking if you fail to plan by reserving parking spots. Reserve necessary elevators. If a high-rise apartment is involved, remember to make the needed arrangements to secure elevators. Some buildings may not let you move in or out unless you reserve one. Many times, a service elevator is allotted and will be protected by padding or blankets. Label your packed boxes according to the room. Congratulations! Now, it is time to unpack. Imagine picking up the first box only to realize it belongs in the bathroom instead of the bedroom. You suddenly find that you have to play a game of musical boxes before you can make your new house a home. Nip this fiasco in the bud by labeling each box with the room that it belongs in. Don’t forget to mark them “fragile” as appropriate. You can avoid feeling overwhelmed with the magnitude of “Mount Got-A-Lot-of-Boxes”! 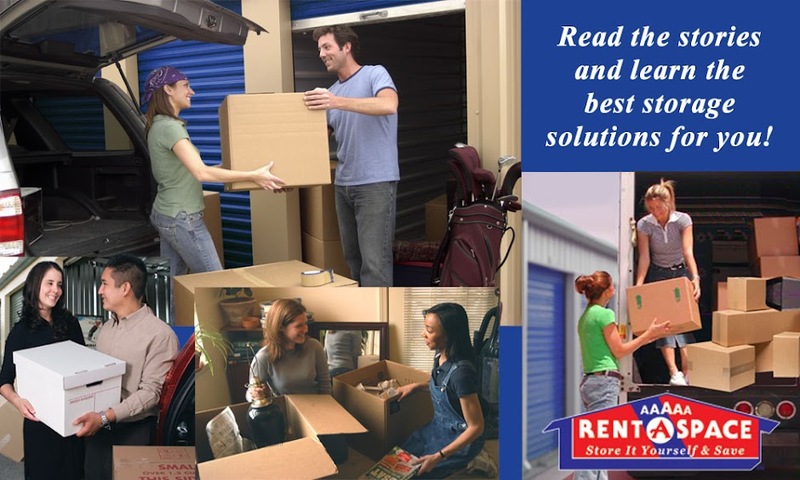 Unpack at your leisure with a 5A Rent-A-Space self-storage unit near Lafayette. Stow away seasonal items until you are ready for them instead of shuffling them back and forth to get to a critical box. We make it much easier to get your unneeded items out of the way with our free moving van. Let us move you into your rented unit so you can get back to enjoying your new abode. As we finish packing away the scarecrows, skeletons, and other spooky decorations, we know that means Thanksgiving time is almost upon us. It is a time of year for good food and giving thanks, but above all else it is a time for family. As the in-laws roll in and the kids come home for the long weekend, the question on everyone's mind is how are we going to have enough space for all of these people? Before you go off and start building a new wing of the house, the most logical first step to take in this situation would be to maximize the amount of space you already have. The best way to go about this is to make sure that you have cleared out any clutter that remains in spare rooms. It's something we've all been guilty of one time or another, as the kids leave the nest their rooms their rooms begin to seem more and more enticing to use to store our stuff. What might start with a few extra boxes quickly becomes the dumping grounds for any and all extra stuff that you have. For a period of time this works out great, but now as Thanksgiving comes around and everyone comes back home you suddenly need the space to be usable once again. Use the 12 month rule: A commonly suggested rule of thumb when attempting to clear out, the 12 month rule suggests that any item that you have not used in the past year you are unlikely to use again. Anything that falls in this category is most likely alright to toss out. Do the Two Trash Bag Challenge: This technique is another classic move to help decide what to keep and what to throw away. To do this you should grab two trash bags, dedicating one to trash that you are willing to throw away, and the other to stuff that you would donate to charity. This technique helps you separate what is really important and what is not. Store the Rest: After these first two steps you are likely going to have a good amount of stuff left over, that's perfectly normal. For the leftover gear that you aren't quite willing to part with at that moment, that's where self storage comes in. An appropriately sized storage unit can be the answer you're looking for to make your spare rooms look neat and tidy before the holidays. Take back your rooms from the clutches of clutter and move whatever is left into a storage space at 5A Rent-A-Space. With our convenient locations in the Bay Area and on Maui, we offer a safe and convenient solution to any of your storage needs. Check out our website or call us at 1-800-5ASPACE (1-800-527-7223) to learn more!